Successfully Added MXR Android 4K TV Box - Wi-Fi, DLNA, Miracast, Airplay, H.265 Decoding, Quad Core CPU, Kodi to your Shopping Cart. Upgrade your TV and turn it into a complete entertainment system with the Android 4K TV Box. Watch lots of free content with Kodi, play games, get cool upgrades from the Play Store and much more wiht this all in one home entertainment centre! If you want to add a little oomph to your TV, the MXR Android TV box will let you do that quickly and without exorbitant costs. Yet, you will have lots of great features at your service, a convenient user-friendly interface, great viewing quality and more. With internal Wi-Fi antenna, you can easily connect to your home network to surf the web and download lots of content from the web. With an Android interface on the big screen, you will enjoy easy navigation and ease of use. The TV box comes with great external connectivity featuring 4 USB ports, HDMI, SD card slot and more. The MXR TV box supports 4K playback and comes with the RK3229 Quad Core CPU for quick and smooth operation. Thanks to Android interface, you will have access to the Play Store where you can get more fun apps. You will get 8G of internal space to store your apps and media and up to 32GB supported externally, via the micro SD card slot. Plus, you will have H.265 decoding that will let you compress media content without compromising quality so you can make the most effect use of all that space. This TV box comes with Kodi 15.2 — and this gives you access to lots of free content from Kodi repositories and the easy-to-use player to enjoy them. With Miracast/Airplay and DLNA support, you also get lots of content sharing options. 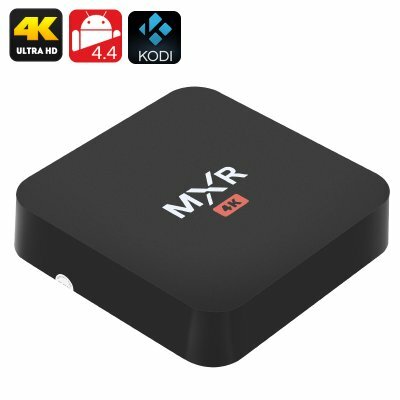 The MXR Android 4K TV Box comes with a 12 months warranty, brought to you by the leader in electronic devices as well as wholesale Android TV boxes..